talkAssure™ SIP trunking is a fast and easy way to increase the number of concurrent calls you can make through one internet connection. SIP trunks remove the physical aspect of a phone line – their virtual phone lines are cloud-based and infinitely scalable. talkAssure™ SIP trunks can be routed via our session border controller, so you can easily integrate them with Microsoft Lync. Our SIP trunks are certified by Microsoft for use with Lync 2013 Server, eliminating the need for gateway devices and reducing network complexity. This service enables you to reduce your telecom expenses and maximise your Lync ROI. For more information about how our SIP trunks could achieve this for your business, please speak to your account manager. SIP trunks (or VoIP trunks) enable users to utilise a single internet connection for making and receiving multiple concurrent telephone calls. SIP trunking provides you with added flexibility, improves business continuity and offers substantial cost-savings over traditional telephony services. By utilising SIP trunks within a converged voice and data network, you can dynamically allocate bandwidth to other needs such as email and web traffic as and when you need it. SIP (Session Initiation Protocol) is a signalling communications protocol used to create, manage and terminate multimedia communication sessions in an IP-based network. A session could be a simple two-way telephone call, or it could be a collaborative multi-media conference session. Once the session is set up, further protocols/software (e.g. codecs) are required to convert the audio stream over SIP. 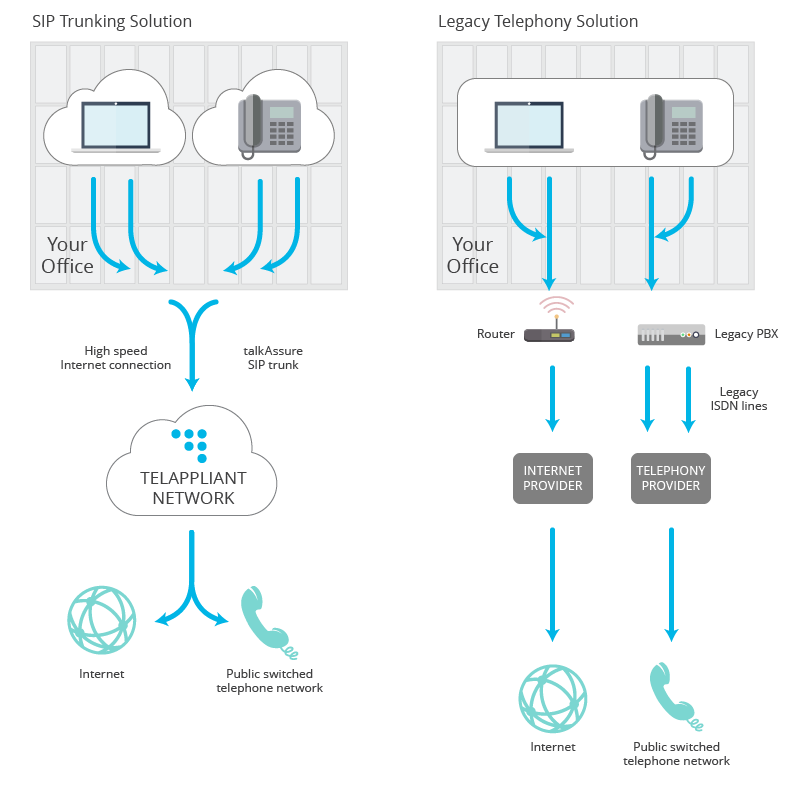 SIP trunking provides virtual telephone lines over a high speed IP network, connecting to an IP PBX. In Telappliant’s case, this is a VoIPOffice (i.e. a hosted PBX). Thus, all the customer needs is a fast internet connection, and this in turn, dictates the number of concurrent calls to be made. "While we use most of the VoIPOffice phone system's functionality, we've found the online call monitoring and call recording particularly valuable for improving customer service. All our calls are through VoIPOffice and the system has proved to be very robust and reliable." "Over the years, VoIPOffice has grown with the business and proved to be reliable and to significantly reduce our overheads. Telappliant is always happy to respond to our unique demands and I highly recommend VoIPOffice Hosted for Call Centres to other businesses."